Federal fishery closures may have put hot spots off limits and reduced total fish caught, but a record number of participants proves the Moby’s Fishing Derby is more popular than ever. Forty boats and 118 people entered the fifth annual derby, bringing back 13 fish on Saturday and 22 on Sunday. 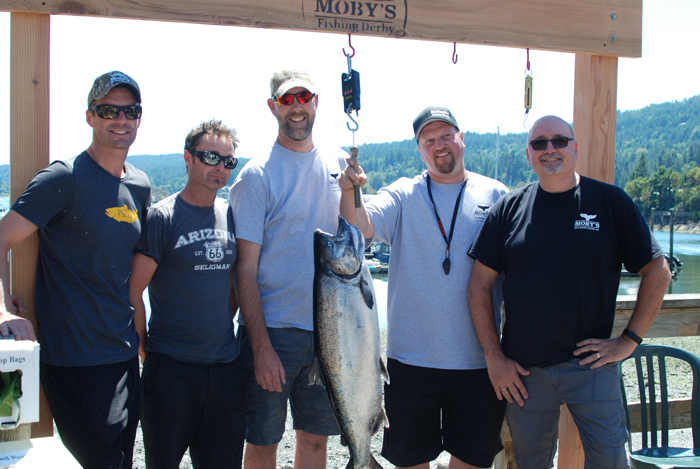 Corey Johnson’s Profiler was the winning boat, which saw Johnson, Darren Lee and Jono McDonald haul in a 26.4-pound Chinook off Point Fairfax on Moresby Island. It was the largest fish caught in all previous Moby’s derbies. “Darren reeled the fish in, I netted it and Jono kept the boat going, so it was a team effort,” said Johnson. The trio won $1,000 top prize for the salmon, plus $11,200 in the Calcutta auction. The auction saw people bid on a boat on Friday night, with the winner receiving 70 per cent of total proceeds. Johnson’s team bid on their own boat. This year’s second prize of $3,200 went to Andrew Archer, for his 14.3-pound salmon and a share of Calcutta winnings. Greg Heese won a $500 halibut rod and reel for catching the cod that was closest in size to the hidden weight of 3.2 pounds. Thanks to the generosity of local businesses, everyone who entered received prizes ranging from BBQs to chainsaws. A dizzying number of items for the post-derby auction at Moby’s Pub were also donated. Between the number of entrants and auction goodies, the event raised more than ever for the Pacific Salmon Foundation. The nonprofit group that’s been around since 1987 will receive $12,100 to help fund its activities, which aim to protect and enhance wild salmon habitat on the B.C. coast.